Protein has always been a particularly popular nutrient with athletes because of its role in building and maintaining muscles. Indeed, athletes need to consume a wide variety of high-quality protein foods in their diets. However, while protein is necessary, it is not the primary fuel for working muscles, and consuming more protein than what the body can use is not going to give athletes larger and stronger muscles. While research shows that protein requirements are higher for athletes to aid in muscle repair and growth, most athletes are already consuming more protein than the body can use. 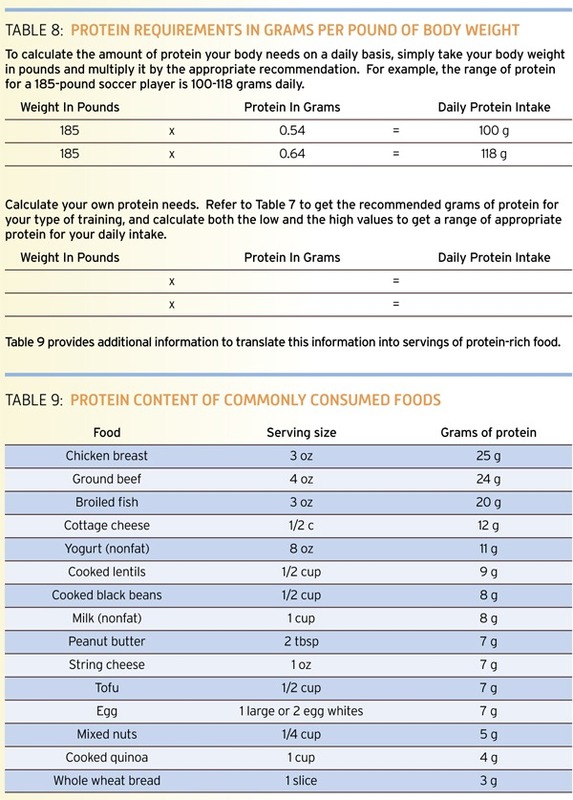 Use the following formulas as guidelines to ensure proper amounts of protein are included in your dietary intake. Many athletes want to add more bulk to their bodies in the form of lean muscle. Many supplement products claim to build muscles. Athletes should take special caution when considering supplementation (please see pages 16-21 for additional information and cautions). Due to the limited regulations of the dietary supplement industry, there is a risk of products being contaminated with sport-prohibited or unknown substances with or without the manufacturer knowing. There is no guarantee that the product contents match with those listed on the label. Taking a lot of extra protein either from supplements or food does not guarantee bigger muscles. If it did, athletes could spend time lounging instead of lifting to build muscles. The body’s ability to recover from games, practices, or intense workouts requires adequate rest and proper nutrition. An important component of the recovery process is consuming both carbohydrates and protein shortly after exercise to restore muscle glycogen and stimulate muscle protein synthesis. Eat breakfast. It is the best way to start the day well fueled. Include foods that contain carbohydrates and protein such as nonfat milk, yogurt, or eggs.